Crêpes are pretty much ubiquitous all over France. 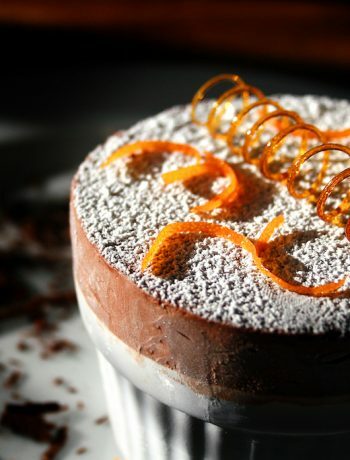 They are eaten as savoury (salées) and sweet (sucrées) dishes, with endless variations. With a food like that, it can often be very hard to pin down where it came from, but not so with the crêpes. 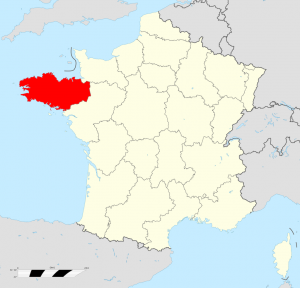 Bretagne (or ‘Brittany’) is a corner of North-western France that was historically occupied by the Britons, who lived in Western England, Wales, Bretagne and the Northern tip of Gallaecia in modern Spain. Bretagne was culinarily hampered by very tough moorland terrain that would grow the square root of nada. In the 12th Century, the Britons got hold of buckwheat, which grows very well on infertile, acidic plots – exactly the terroir found in Bretagne. They ground the wheat down to make a flour, added water and salt to make batter, and spread the mixture on hot surface spread with a wooden tool and started banging out the first crêpes. Buckwheat is still used to make savoury crêpes, but white flour is used for crêpes sucrées. Auguste Escoffier wrote four recipes for crêpes, which he labelled A, B, C, and D. Deeper into his book, you can find a recipe for crêpes Normande, which combines apples (hence ‘Normande,’ famous for its apples) with a crêpes sucrées to create one of the most bang-up French-tasting things I have ever eaten. The recipe given here is that of Escoffier. 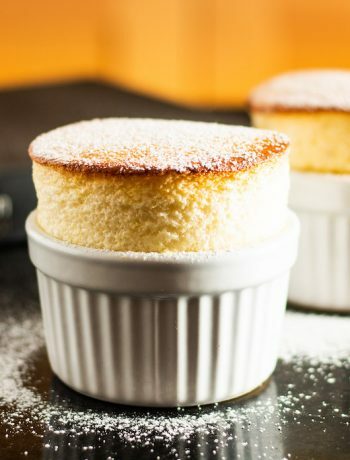 If you are used to making pancakes, then you really need to swap the oil out for butter to make this Escoffier Recipe A (with a small alteration for easier handling), because oil will result in the sugar sticking the crêpe to the pan. Pancake flipping skills are an asset here. Whisk the all ingredients apart from the butter and apples with half the milk to combine, and then whisk in the rest of the milk to make a batter. Resist the temptation to use a blender as it will over-activate the gluten in the flour and stop the batter from running properly in the pan. Set aside for a while. Very lightly cook the apple slices in a pan with a little butter, just to soften them. Set aside. Heat the butter in a crêpe pan until foaming. Add a ladle of batter and spread out either by moving the pan or using a wooden spreader. Quickly add some apple slices in a nice pattern, and spread over a little more of the batter. Cook for few moments until browning, and then turn the pancake over in the pan to cook the other side. 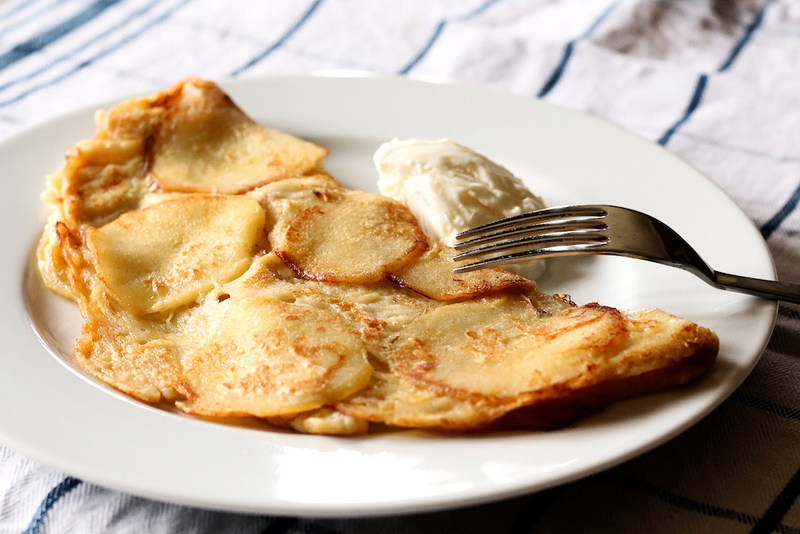 With crêpes Normande, this takes practice because the apples reduce the cohesively of the crêpe. If you can do a full flip, then this is a good skill to acquire. Don't worry if you mess it up – hide the error with a fold. 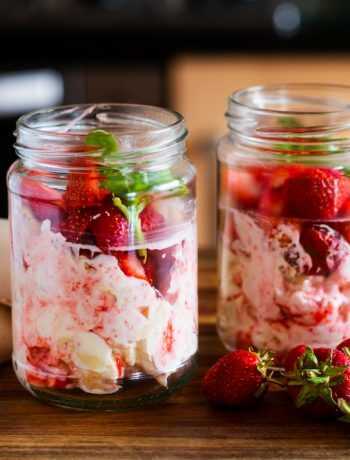 Fold onto a plate once cooked and serve with ice cream or Chantilly cream.